Westerns are one of the longest running genres in media. Films like The Great Train Robbery, Shane and Red River were beloved in first half of the 20th century. The tradition continued in the 2nd half with titles such as Unforgiven, Tombstone and The Quick and the Dead. The stories do not always rely on taking a serious tone either as seen in comedies Three Amigos!, Blazing Saddles and Shanghai Noon. The point I am making is that Westerns can vary in tone and story telling which leads to a multitude of options that can be taken by filmmakers. 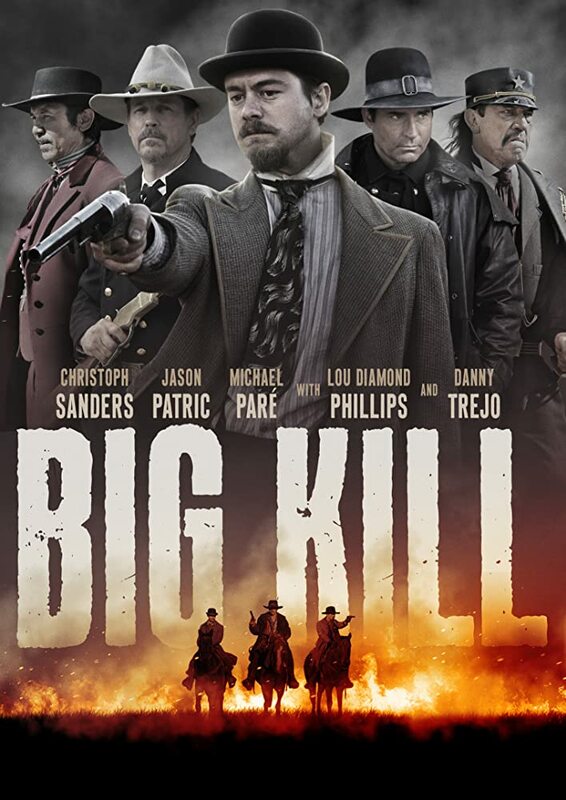 Unfortunately, the film Big Kill from writer/director/star Scott Martin although marking everything off the “Make-A-Western Checklist” falls far off the list from being an enjoyable Western. The film stars recognizable names Jason Patric (The Lost Boys, Sleepers), Lou Diamond Phillips (La Bamba, Young Guns) and Danny Trejo (Machete, Desperado); but you’ll miss the latter after the first 5 minutes. The film revolves around two wayward gamblers, Jack and Travis, as they come upon the town of Big Kill. Along their journey they meet a young man from the East named Jim who is responding to a request from his brother who runs a saloon in Big Kill. The rest of the film unfolds as you would imagine with Patric and Phillips playing villains, Preacher and Johnny Kane. The film did have quality set and costumer designers yet the film comes off as watching people cosplay as Red Dead Redemption 2 characters. For me, the film never got off the ground and was hard to keep going. The opening credits sequence comes off amateurish and the soundtrack offers no value other than a hokey tone. The characters had no depth so I never felt behind the two protagonists and the villains felt bland. Patric gave the better performance throughout but an awkward, out of place scene of him in an opium den felt ridiculous. The paint by numbers story leads us to the “big finale” that involves a gun fight. I thought the film offered all it had but I was wrong. Johnny Kane’s, what a name too, finale came off childish and the rest well… it just happens. The final showdown behind Preacher and Jim was as bad as anything I’ve seen. One might think it falls into it’s so bad it’s funny but from this reviewer’s POV there is no redeemable value in watching this. The running time does the film no favors either at just over 2 hours feels like they crammed in every stereotype they could. I commend anyone who goes out and makes a film; unfortunately that ends just after the film wraps as you can never tell how the final product will come out. You are more than welcome to check the film out for yourselves if you can spare your attention span being sent to the gallows.